These are large studio apatments in the form of a bed-sitting room furnished with a double bed and a single convertible sofa-bed and a fully equipped kitchen which includes fridge, cooker with oven, crockery, cutlery and all the necessary utensils. 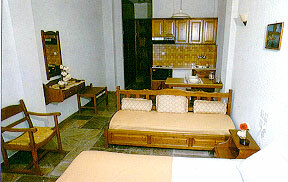 The studios are pleasantly decorated and furnished with wood and stone in the traditional Pelion manner. Each apartment has its own toilet and shower. Hot water is available at all times. From the balconies a panoramic view across the Gulf is obtained while if you look a little nearer, the village can be seen.